Love Western sandwiches? 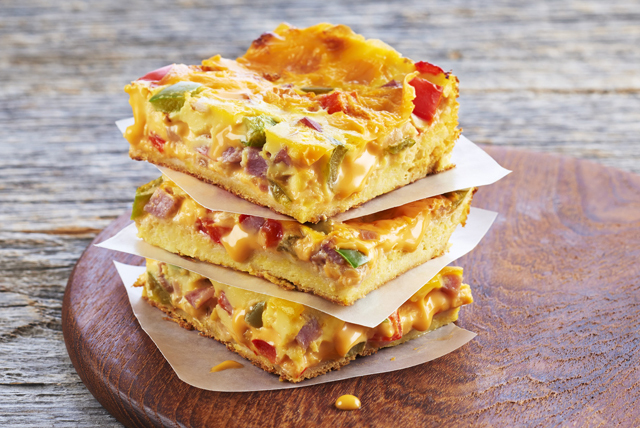 Try our Western Bars recipe. These bars are great to enjoy as part of a weekday breakfast on the run or weekend brunch. Heat oil in medium nonstick skillet on medium heat. Add onions; cook and stir 3 min. Add peppers; cook and stir 3 min. or until crisp-tender. Remove from heat. Unroll crescent dough onto bottom of 13x9-inch pan; press dough to cover bottom of pan while firmly pressing perforations together to seal. Prick with fork at 1-inch intervals. Bake 8 min. or until lightly browned. Meanwhile, coarsely chop 2 Kraft Singles. Top crust with remaining (whole) Singles, ham and vegetables. Shake egg carton well. (Or, lightly whisk eggs in bowl.) Pour eggs over vegetables; top with chopped Singles. Bake 30 min. or until centre is set. Cool 5 min. before cutting into bars. NatureggTM Simply EggsTM are trademarks of Burnbrae Farms Ltd. Cool, then refrigerate any leftovers. Refrigerate up to 3 days. Reheat in microwave just before serving. Serve with a crisp green salad and fresh fruit for a simple weekend brunch.